AID Atlanta has been saving and transforming lives since 1982. The agency was founded as a grass-roots response to the devastating and fatal impact of HIV/AIDS on the Atlanta community, and it’s now the largest most comprehensive AIDS Service Organization in the Southeast United States. The mission of AID Atlanta is to reduce new HIV infections and improve the quality of life of its members and the community by breaking barriers and building community. 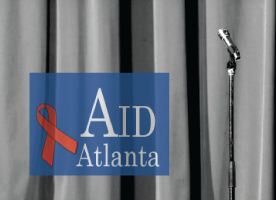 On Tuesday, September 28, 2010, AID Atlanta will host its second annual HIV/AIDS benefit, “I Can Be.” Advocates Mo Stegall and Dawn Montgomery will host the night’s events, which will include performances by some of Atlanta’s top entertainers. The benefit will also feature a diverse range of speakers, from State Representative “Able” Mabel Thomas, Senator Donzilla James, Southern Christian Leadership Conference (SCLC)-GA President, the Rev. Sam Mosteller, Ms. Liberia Georgia, to the AID Atlanta Executive Director, Tracy Elliot. All proceeds from the night will benefit AID Atlanta. 5,684 HIV tests and HIV prevention counseling. 31,581 Youth educated about HIV/AIDS Through our youth program. 19,939 calls fielded by our Georgia AIDS & STD Infoline. These results wouldn’t have been possible without the support of the Atlanta community. Please take a moment to learn more about AID Atlanta’s 2nd Annual HIV/AIDS Benefit Concert “I Can Be,” or to simply donate so that AID Atlanta can continue to offer these services to the community throughout 2010.